The East/Midwest species are Rhithrogena jejuna, Rhithrogena manifesta, and Rhithrogena impersonata, which is arguably the most important of a minor group. All of them are widespread and none of them are abundant except in rare locations, mostly in Michigan and Wisconsin. Shuck: The shed exoskeleton left over when an insect molts into its next stage or instar. 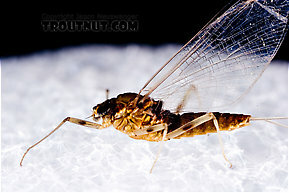 Most often it describes the last nymphal or pupal skin exited during emergence into a winged adult.). How slow is slow? 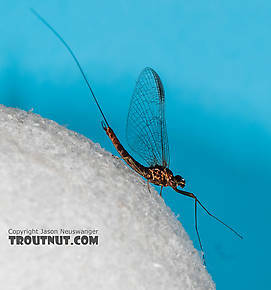 Depth and temperature are also suspected of playing a role, so whether to fish a nymph, a sunken emerger or dun imitating wet fly usually remains open to experimentation in any given hatch situation. Rhithrogena nymphs are best known for their unique gills: the first and last pair of gills wrap around the bottom side of the abdomen, creating a "suction cup" which helps them cling to rocks in water even faster than other clingers can tolerate. They have been portrayed strangely in angling texts, to the extent that they are hard to recognize when first observed in the wild. Many book illustrations show the gills fully spread out and opaque, giving the nymphs an exaggerated ovoid shape. Perhaps because it's hard to draw them any other way in pencil. But this really misrepresents the actual insects; you have to look pretty closely to notice the gill extensions under the body. They are very translucent and easy to miss. In the natural state their transluscent gills are also held much closer to their bodies. These drawings also show short, robust, crab-like body shapes, perhaps to somehow emphasize their proficiency as clingers. This further exacerbates the misconception. They are great clingers, but their bodies are more narrow and streamlined than drawings indicate, as demonstrated in the photos below. It is commonly held that clingers are flattened to make their lives better adapted to faster water. Their teardrop shape is certainly a classic symbol of aero and hydrodynamic perfection, so there must be some connection, right? It seems to me that such ideas show a complete misunderstanding of the hydraulic reality in which they live. Current is negligable even in the fastest a few mm. from the surface of solid objects. In fact, it is actually quite calm. I've observed baetids clinging by their tippy toes to the tops of rocks in fast riffles with no apparent effort, often next to clinger species that look like they're hanging on for dear life. 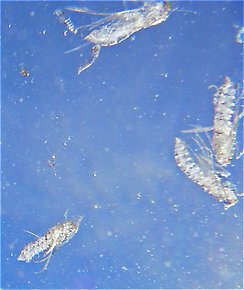 What if clinger nymphs are flattened not to hold their place in fast currents but rather to facilitate movement in their ecological niche of the cramped spaces under and between cobble or crevices in other substrate types?